Branding Moment: Choose Your Words Carefully To Convey Your Message! Using the right words to convey your message is one of most important factors in branding and marketing yourself and or your company. The right words will emphasize your uniqueness and your value to your intended audience. 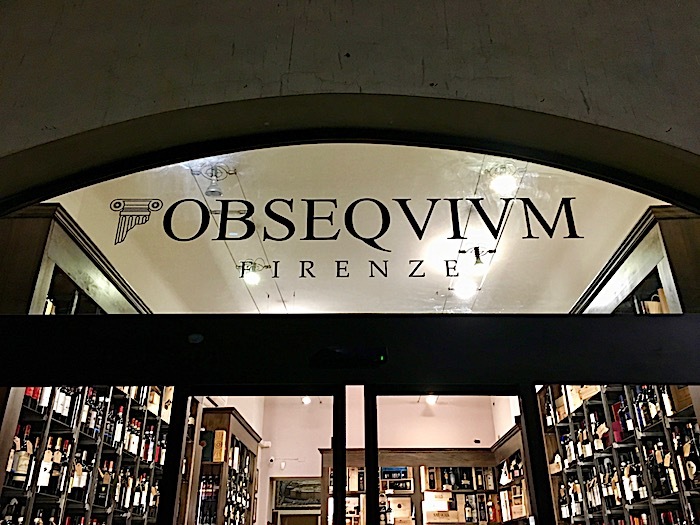 Last year, as we were meandering through the back streets of Florence, we walked into this wine store. We were impressed with the façade and the interior of the store as pictured above. We had a delightful conversation with the owner, and he furthered our knowledge on Italian wines. As we walked out, we focused on the name of the store.! Just to make sure, we knew what the word obsequium meant we looked it up. We even researched the Italian dictionary to be sure that the meaning and nuances of the word in order to be certain that the meaning agreed with the English version. And they did! Definition of obsequium. : the customary respectful behavior due from a freedman to his patron or former master under ancient Roman law including freedom from lawsuit by the freedman except with the consent of the praetor (the magistrate) and the duty to support the patron when needy. We cannot figure out how the word "obsequious relates to the wine industry. The logo font is adorned with a Roman column in the design is attractive. It conveys history and heritage. We enjoyed looking at their tastefully displayed wines (pictured below.). From our point of view, we do notunderstand how this brand relates to wine. As far as this brand is concerned , we appreciate that it provided us with an opportunity to write a branding moment blog post. Are you using the right words to convey your message?